Aside from rent, I have only one constant big-ticket expense in my life: food. I spend more on eating out than I do on anything else. And that becomes a problem when I’m running out of money but not days in the month. My lowest point came when I had only $50 to my name, and payday was a couple weeks away. I put $20 aside as a cushion and used the other $30 to buy groceries, knowing they’d have to last me two weeks. Surprisingly, it wasn’t an altogether unpleasant experience. Even today I fall back on this routine when I need to curb my craving to eat at every restaurant known to mankind. Here’s how I stretch $30 worth of groceries into two weeks’ worth of meals. I also use the cash-back app Ibotta to earn rebates on my groceries. This trip earned me $1.50, bringing my total to $28.06. Here’s how I combine these groceries to feed myself. During the second week, I eat the same meals but switch up the order so it doesn’t feel like deja vu. For breakfast, a bowl of cereal holds me over ’til lunch, which is some comforting grilled cheese sandwiches. To add a little twist to my sandwiches, I sprinkle some onions on top of the cheese before it starts melting. For dinner, I treat myself to some pasta. I cook about a fistful of noodles. To give the sauce a nice flavor, I start by sauteing some onions in a pan. Then I add about a quarter of the sauce from one bottle and stir in some lemon pepper and salt for an extra kick. I’ll eat half of this sauce on my pasta tonight. When I eat the rest with bread tomorrow (spoiler! ), it’ll taste more like a meal. If I wanted to cook all the noodles and sauce at once, I could just portion them out for several meals. I usually end up with enough pasta to last me six meals — or seven if I don’t eat until I’m stuffed. Breakfast is still cereal and will be for the rest of the two weeks. It’s OK — it’s only two weeks. Lunch is some of that nice five-cheese bread with the leftover pasta sauce from last night. 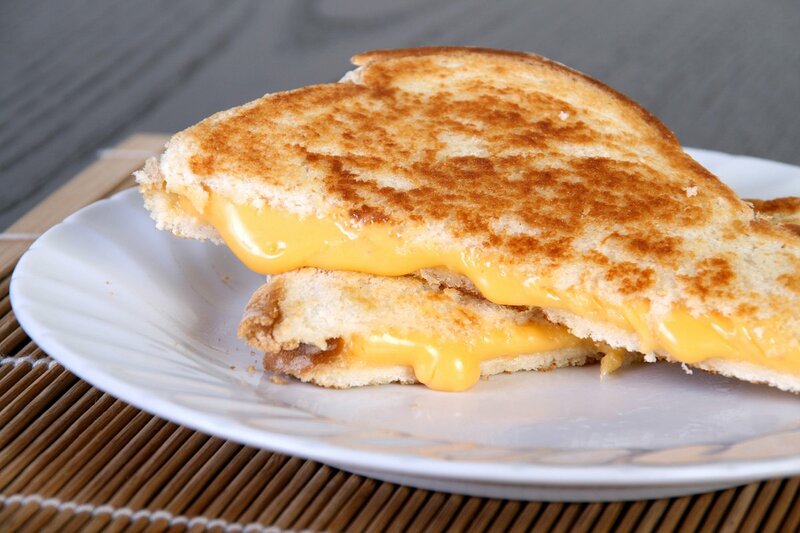 It may not sound like much of a lunch, but cheese and bread together can be surprisingly filling. Dinner is something my mom makes when we have leftover rice from lunch. This recipe requires cold rice, so I need to cook it and set it aside for at least a couple hours before dinner. I cook about 2 cups of rice for this meal, which gives me enough leftovers for lunch the next day. First, I dice an onion and saute it in a pot. As the onions cook, I add some salt and a dash of red chili powder. Once the onions are cooked, I add the cooked rice to the pot and sprinkle in enough chili powder to make the rice a little spicy, tasting as I go. I stir the mixture occasionally until the rice starts to gain a slight red color. If I happen to have some plain yogurt, I’ll add a spoonful, but it’s not essential. I know what I’m having for breakfast: cereal again. Lunch is the leftover rice from dinner. For dinner, I go light with some tomato soup and a grilled cheese sandwich. Alternatively, I could make some homemade croutons by putting butter on diced pieces of bread crusts and baking them in the oven until they’re golden-brown. I’ve only done this once, but it’s a nice change. Breakfast is always going to be cereal. For lunch, I have pasta and sauce, like I had for dinner on day one. Dinner is toasted cheese bread with pasta sauce. It’s one of my favorite meals, so I could have it every day! Today’s meals are dedicated to rice (except for breakfast, which is, of course, cereal). For lunch, I cook some rice and set some aside for dinner. To my lunch portion, I add butter and spices. I’m liberal with the butter to give the rice a sweet, gooey taste that makes my tastebuds sing. I can never have enough butter in my rice. For dinner, I use the leftover rice from lunch to make — you guessed it — spicy rice with diced onions. At this point, I need comfort food. It’s been a long week of eating frugally, and I still have eight more days to go. I choose tomato soup for lunch and some grilled cheese sandwiches for dinner. I eat pasta for lunch and tomato soup for dinner. A heavy lunch and a light dinner sounds like a winning combination to me. These meals are pretty monotonous, as the budget doesn’t leave a lot of room for variety, fruits, vegetables or snacks. Depending on what’s on sale and the total grocery bill, I might have room to buy some bananas. Not only are bananas among the cheaper fruits at grocery stores, they’re also quite filling. The health factor is an added bonus. I was scared the first time I resorted to this method of survival. I didn’t like feeling pinched for pennies and not being able to eat whatever I wanted. It was a lesson in humility and planning. So, when I got my next paycheck, the first thing I did was portion out the money. I put aside the money I’d need for rent and utilities, then I did something I typically only did when my parents reminded me: I deposited $20 into my savings account. I also set a reminder on my phone to deposit $20 in my savings account every payday. Depending how much I have left over after paying for the essentials, that amount sometimes changes. But I’ve become strict with myself on one point about this process: I have to save at least $10 from every paycheck, which can be the difference between snacks or no snacks. Your Turn: How do you stretch your food on a limited budget? Lakshna Mehta is an almost-always hungry person — hungry for food, adventure and new experiences. She loves writing articles that could be useful to people.